BIG Fish. I had never seen one of these before until coming upon it in the aquarium in Valencia, Spain. It looked like a Monty Python fish to me, like a huge puppet hand. See the finger tips to the right. (Do scuba divers try to shake hands to find it’s the fish’s tail?) The puppet hand has scallop shells for gils; when the gil is flat against the body, it is a picture of a scallop shell. The puppet hand’s mouth is open in a small circle like it is saying—“Oh No, It’s the Mr. Bill Show!” I got the feeling the fish was waiting for the audience to laugh before going on to its next act. The one I saw had a body (less the fins) that measured two feet high by four feet long. This is the photo I took. What do you think? 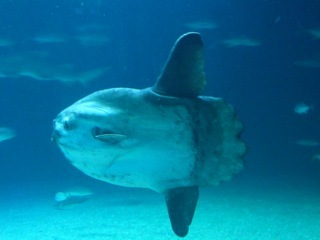 Wikipedia says it is also called a Mola fish. (Maybe they should call it a puppet fish or more accurately, a Puppet Hand.) And it says these fish reach 10 feet in height. That explains why more aquariums don’t have Sun Fish. Here is a great photo.